The enclosure of the Shrine was packed again as it welcomed thousands of “messengers”, coming in huge majority from the country dioceses, who were taking part to the Children Pilgrimage to thank Jesus for the fact of having a Mother. The theme of this year arose from the affirmation uttered by Pope Francis in Cova da Iria in 2017: “We have a Mother!”. The auxiliary Bishop of Braga, D. Nuno Almeida, presided the pilgrimage, and, using very simple words he addressed the small pilgrims present in Fatima this Sunday despite the intense rain that poured down during all the celebrations, and established a parallelism between mothers and Our Lady to explain that Her love for humanity “is a close and merciful love”, just like the love a mother feels for her son, from the moment he is conceived and until he dies. “She takes care with a motherly love of her Son’s brothers who, between perils and distresses, keep marching on earth towards the heavenly homeland,” said the prelate. “We are trying to open our heart to Our Lady.” When we pray the Ave Maria in silence in our room; when we pray the rosary with our family, in our parish or association, we can be sure that Our Lady is with us and is happy when we speak to her and trust her.” The prelate invited the children to repeat: “I have a special place in Our Lady’s heart!”. The prelate also asked them to say a prayer for all the mothers. “We want, today and every day, to pray with love and gratitude for our mothers on earth who take care of us with tenderness, always accompany us, know what we miss and protect us. Tonight, once home, we will embrace and kiss our mothers and thank them for their love!”. And, as praying the rosary was one of the requests that Our Lady left to the shepherds, D. Nuno Almeida also encouraged the children to always keep this prayer in mind. During the Eucharist, concelebrated by six bishops and 61 priests, a little play was organised and, during the Liturgy of the Word, a postman came four times to bring a card to the altar. In parallel, the children could drop the original postcards, with a drawing or a text on which they had been working in May, in one of the different letterboxes available in the Enclosure. The pilgrimage thus recreated the idea of “the letters to Our Lady” as it exists in the Chapel of Shrine of Fatima and where each pilgrim can leave a message to Our Lady of the Rosary of Fatima. 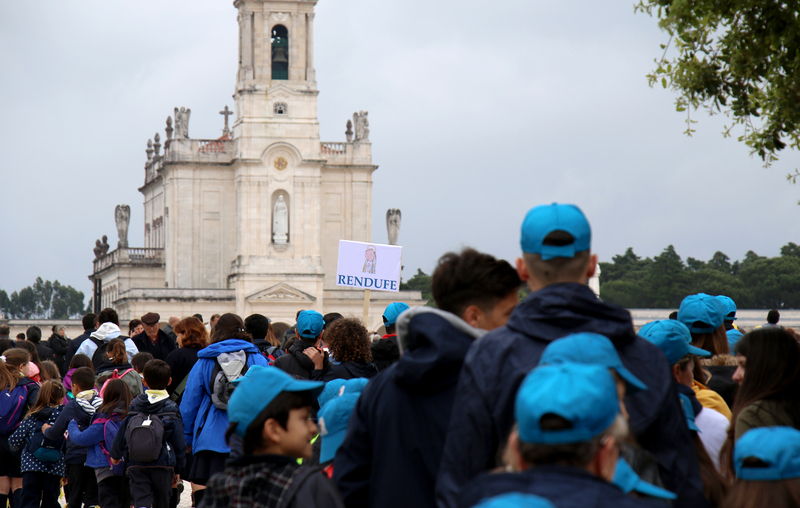 Besides the huge number of children coming from most of the Portuguese dioceses, including the Autonomous Regions, 25 groups coming from Poland, Spain, Italy, Germany and Ireland were participating, which made a total of 150 thousand pilgrims. At the end of the celebration, D. Antonio Marto, Bishop of the diocese of Leiria-Fátima, expressed the “great happiness” that he felt seeing all these children gathered around the “Heavenly Mother” like a “family”. “I would like to be able to greet each one of you, but as it is impossible, I embrace you all from here as a greeting, because each one of you has a special place in my heart”, he declared. “Take the oratory with you and promise me that you will not forget to pray for the peace in the families and for the peace in the world”, he asked again. Finally, the president of the celebration, D. Nuno Almeida, asked for a round of applause for the bishop of the diocese of Leiria-Fátima, who has recently been appointed Cardinal by Pope Francis.